An awesome non-profit fundraising solution with smart automations and wealth screenings. Attracy more donors today with advanced donor pledge management solution. A celebrated conductor of baroque music known for his musical complexities and stylistic innovations. Johann Sebastian Bach was born in Eisenach, Thuringia, Germany on March 31, 1685. His father, Johann Ambrosius Bach, was atalented violinist, and taught his son the basic skills for string playing; another relation, the organist at Eisenach’s most important church, instructed the young boy on the organ. In 1695 his parents died and he was only 10 years old. He went to go stay with his older brother, Johann Christoph, who was a professional organist at Ohrdruf. Johann Christoph was a professional organist, and continued his younger brother’s education on that instrument, as well as on the harpsichord. After several years in this arrangement, Johann Sebastian won a scholarship to study in Luneberg, Northern Germany, and so left his brother’s tutelage. Bach had a beautiful soprano singing voice, which helped him land a place at a school in Lüneburg. Sometime after his arrival, his voice changed and Bach switched to playing the violin and the harpsichord. Bach was greatly influenced by a local organist named George Böhm. In 1703, he landed his first job as a musician at the court of Duke Johann Ernst in Weimar. There he was a jack-of-all-trades, serving as a violinist and at times, filling in for the official organist. Bach had a growing reputation as a great performer, and it was his great technical skill that landed him the position of organist at the New Church in Arnstadt. He was responsible for providing music for religious services and special events as well as giving music instruction. 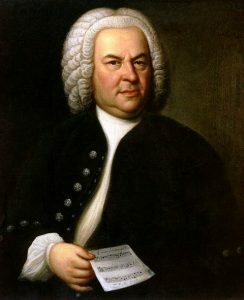 An independent and sometimes arrogant young man, Bach did not get along well with his students and was scolded by church officials for not rehearsing them frequently enough. Bach did not help his situation when he disappeared for several months in 1705. While he only officially received a few weeks’ leave from the church, he traveled to Lübeck to hear famed organist Dietrich Buxtehude and extended his stay without informing anyone back in Arnstadt. After a year in Mühlhausen, Bach won the post of organist at the court of the Duke Wilhelm Ernst in Weimar. He wrote many church cantatas and some of his best compositions for the organ while working for the duke. 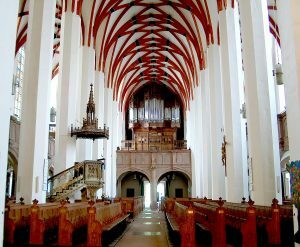 During his time at Weimar, Bach wrote “Toccata and Fugue in D Minor,” one of his most popular pieces for the organ. He also composed the cantata “Herz und Mund und Tat,” or Heart and Mouth and Deed. One section of this cantata, called “Jesu, Joy of Man’s Desiring” in English, is especially famous. In 1717, Bach accepted a position with Prince Leopold of Anhalt-Cöthen. But Duke Wilhelm Ernst had no interest in letting Bach go and even imprisoned him for several weeks when he tried to leave. In early December, Bach was released and allowed to go to Cöthen. Prince Leopold had a passion for music. He played the violin and often bought musical scores while traveling abroad. While at Cöthen, Bach devoted much of his time to instrumental music, composing concertos for orchestras, dance suites and sonatas for multiple instruments. He also wrote pieces for solo instruments, including some of his finest violin works. His secular compositions still reflected his deep commitment to his faith with Bach often writing the initials I.N.J. for the Latin In Nomine Jesu, or “in the name of Jesus,” on his sheet music. In tribute to the Duke of Brandenburg, Bach created a series of orchestra concertos, which became known as the “Brandenburg Concertos,” in 1721. These concertos are considered to be some of Bach’s greatest works. That same year, Prince Leopold got married, and his new bride discouraged the prince’s interest in music. Bach completed the first book of “The Well-Tempered Clavier” around this time. With students in mind, he put together this collection of keyboard pieces to help them learn certain techniques and methods. Bach had to turn his attentions to finding work when the prince dissolved his orchestra in 1723. In 1723, Bach began the final stage of his career: his position as Cantor (that is, Music Director) at the St. Thomas Church and School in the German city of Leipzig. In Leipzig, Bach’s job was to teach children at the parish school, and oversee the city’s church music. It was an exhausting job, especially in the first several years, when Bach wrote new church music for services every single week. Bach also created musical interpretations of the Bible using choruses, arias and recitatives. These works are referred to as his “Passions,” the most famous of which is “Passion According to St. Matthew.” This musical composition, written in 1727 or 1729, tells the story of chapters 26 and 27 of the Gospel of Matthew. The piece was performed as part of a Good Friday service. One of his later religious masterworks is “Mass in B minor.” He had developed sections of it, known as Kyrie and Gloria, in 1733, which were presented to the Elector of Saxony. Bach did not finish the composition, a musical version of a traditional Latin mass, until 1749. The complete work was not performed during his lifetime. Bach remained at his post in Leipzig until his death in 1750. He was creatively active until the very end, even after cataract problems virtually blinded him in 1740. His last musical composition, a chorale prelude entitled “Before They Throne, My God, I Stand”, was dictated to his son-in-law only days before his death. Little personal correspondence has survived to provide a full picture of Bach as a person. But the records do shed some light on his character. Bach was devoted to his family. In 1706, he married his cousin Maria Barbara Bach. The couple had seven children together, some of whom died as infants.While at Cothen, Bach’s wife, Maria Barbara, died. Bach remarried soon after to Anna Magdalena and forged ahead with his work. He also forged ahead in the child-rearing department, producing 13 children with his new wife – six of whom survived childhood – to add to the four children he had raised with Maria Barbara. Several of these children would become fine composers in their own right – particularly three sons: Wilhelm Friedmann, Carl Philipp Emanuel and Johann Christian. Bach clearly shared his love of music with his children. From his first marriage, Wilhelm Friedemann Bach and Carl Philipp Emanuel Bach became composers and musicians. Johann Christoph Friedrich Bach and Johann Christian Bach, sons from his second marriage, also enjoyed musical success.